Renovation project managers were pleased to learn that the 3M Scotchshield Ultra Safety & Security line of window films could protect the furnishings from fading and sun damage, as well as increase the building's security. 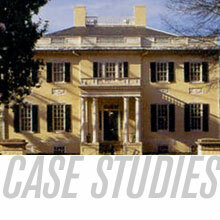 Built in 1813, the Virginia Governor's mansion is the oldest continuously occupied executive mansion in the nation. As project managers neared the completion of a six-month, $7.5 million renovation of the house, they pondered how best to protect the residence in two ways. First, they wanted to preserve the priceless antique furnishings and fabrics, hand-woven carpets, and artwork from the damaging effects of the sun. Second, they wanted to supplement the mansion's safety and security system by making it difficult to break through the building's glass windows and doors. John Paul Hanbury, principal with Hanbury Evans Newill Vlattis & Company, the architectural firm hired to design the mansion's renovation, had recently encountered similar issues on another project and had resolved them with the help of 3M window film. As a result of that project's success, he contacted Bob Coburn of Glass Protection Services, a 3M-authorized Dealer / Applicator in Norfolk, Virginia. Because the architect's priority was maintaining the building's aesthetics, Coburn recommended using a clear window film, SCLARL400 Superior Strength Clear, which is part of the 3M Scotchshield Ultra Safety & Security line of window films. In addition to blocking up to 99% of the sun's damaging UV rays, these window films dramatically increase the level of safety and security of glass windows and doors by serving as an invisible shield to make it extremely difficult to break through glass. Within a week, Coburn's team completed the installation of window film to more than 420 panels of glass. A week after the installation, Michael Wescott, project manager with contractors Daniel & Company, was so impressed with the results that he asked Glass Protection Services to return to install film to all 96 panels of the mansion's security station. Since the restoration, hundreds of visitors have toured the mansion, unaware of the added protection preserving the building's furnishings and overall safety and security. "Our hope was that the 3M window film would provide invisible protection for the Governor's mansion, and that's exactly what it did," says Hanbury. "We did not install film on every single window of the mansion, and you can not tell the difference between the windows that have it and the windows that do not."